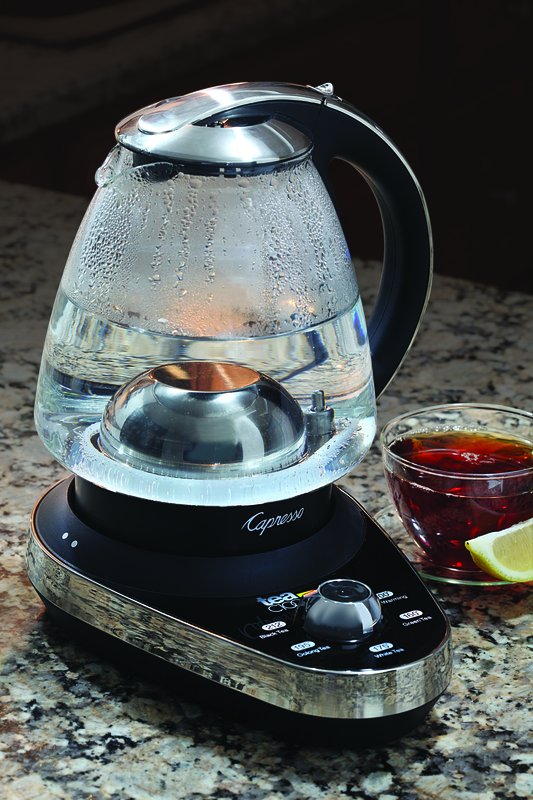 The new Capresso teaC100 electric water kettle makes it even easier for tea lovers to enjoy their favorite cup of tea. This fast, energy efficient water kettle includes five easy-to-read temperature settings, ranging from 100° to 212°F, conveniently labeled according to the type of tea the user is preparing, including green, white, oolong and black tea. Additionally, the 48-ounce (6 cup) capacity teaC100 can warm water for French press coffee, or simply keeps water warm in its sturdy glass pitcher. Designed to heat the water to the desired temperature quickly, the stainless steel heating element boils water in half the time as a traditional stovetop kettle – saving time and energy. The newest model in Capresso’s growing line of electric kettles, use the teaC100 to brew the perfect glass of tea with our handy Guide to Steeping Tea. Click here to learn more about the Capresso teaC100. Ristretto, Macchiato, Cappuccino, Mocha, Americano… Most coffee lovers have heard of these gourmet drinks at one time or another, but how many have attempted to prepare these coffee house espresso-based beverages at home? Creating these coffee house drinks in your own kitchen is simple with our Guide to Espresso-Based Beverages. We recommend having a Capresso espresso machine and a Capresso automatic milk frother on hand when preparing these recipes. Espresso 1-1.5 ounce shot of coffee brewed at high pressure for 20-25 seconds. Espresso is the basis for many gourmet coffee specialty drinks. Ristretto 0.5-0.7 ounce shot of coffee brewed at high pressure for less than 20 seconds. The ristretto has a very intense flavor that is bolder with more body than a traditional espresso. Lungo 2-4 ounce shot of coffee brewed at high pressure for 45-60 seconds. The lungo is more bitter than espresso as more water is extracting the coffee’s flavor. Macchiato A shot of espresso topped with a spoonful of frothed milk served in a demitasse cup. Espresso con Panna A shot of espresso topped with whipped cream in a demitasse cup. Espresso Affogato A scoop of gelato or ice cream “drowned” in a shot of espresso. Cappuccino A shot of espresso topped with 1/3 steamed milk and 1/3 frothed milk in a large cup. Latte A shot of espresso topped with 2/3 steamed milk and a few spoonfuls of frothed milk in a large cup. Latte Macchiato Fill a cup with steamed milk and top with a few spoonfuls of frothed milk. Pour a shot of espresso on top of the foam to “mark” the latte. Hazelnut Latte A shot of espresso mixed with hazelnut syrup, topped with steamed milk and a few spoonfuls of frothed milk. Vanilla Latte A shot of espresso mixed with vanilla syrup, topped with steamed milk and a few spoonfuls of frothed milk. Caramel Macchiato Fill a cup with steamed milk and caramel sauce, and then top with a few spoonfuls of frothed milk. Pour a shot of espresso on top of the foam to “mark” the latte. Add caramel sauce to the top if desired. Mocha A shot of espresso mixed with chocolate syrup topped with steamed milk. Add whipped cream and cocoa powder to the top is desired. Americano A shot of espresso top with 6-8 ounces of hot water. 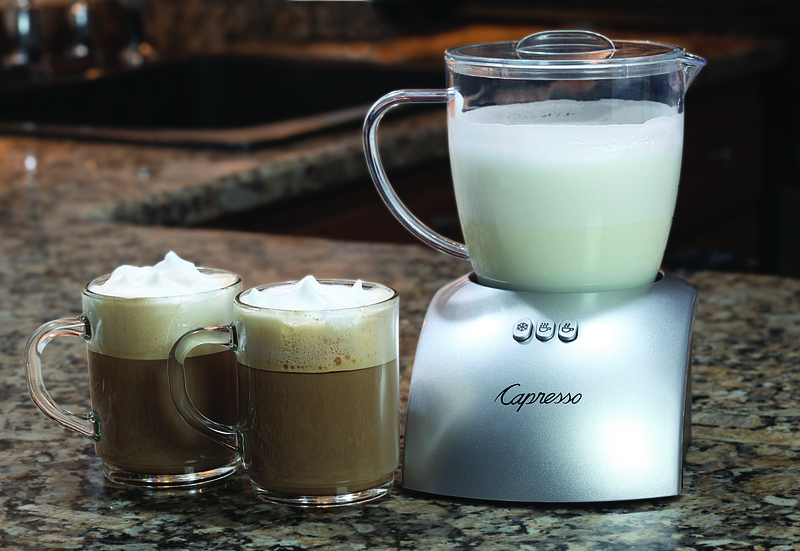 Watch the taste-tempting beauty of milk frothing with the new Capresso froth PLUS™. 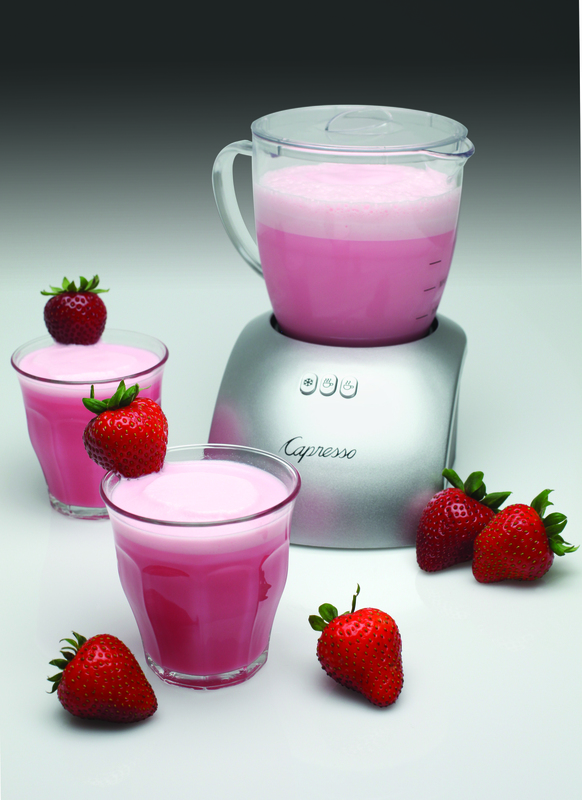 It creates unlimited possibilities for tea, coffee, milk, smoothies and shakes. The froth PLUS™ is the largest capacity frother on the market, making eight ounces of milk froth, or 12 ounces of hot milk. It comes with a BPA-free clear-plastic milk pitcher with a cool touch handle, and a sleek silver base. Easy to use, simply pour chilled milk into the milk pitcher and place the lid on top. Press one of the illuminated control buttons to choose one of the three temperature settings – hot, warm and cold. Then, the froth PLUS™ goes into action using a unique patented frothing disk to create perfectly foamed or steamed milk that is ready to be served immediately. 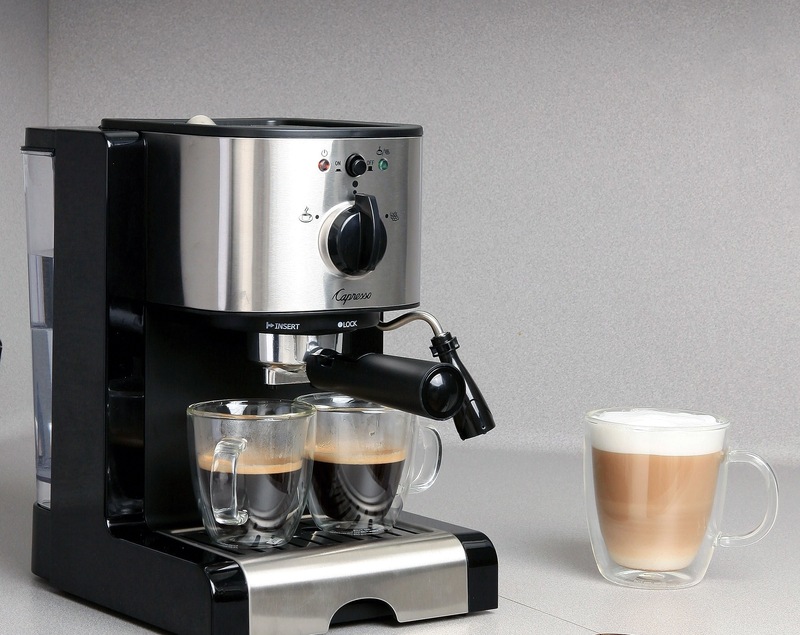 The perfect companion to a Capresso coffee maker or espresso machine, click here to learn more about the Capresso froth PLUS™. Celebrate spring with our light and fresh Strawberry Crème. The froth PLUS whips air into the milk to create a frothy beverage that resembles a strawberry milkshake without added fat. This delicious drink is not only the perfect color for the season, its classic flavors are sure to delight your taste buds. Place the frothing disk in your Capresso froth PLUS and ensure it is securely snapped inside the bottom of the frothing pitcher. Add milk and vanilla extract to frothing pitcher. Place lid and press the Cold button. After two minutes, remove frother lid and slowly add strawberry syrup. Replace lid and wait for frother to automatically shut off. Pour into glasses and garnish with fresh strawberries.